Obsessive readers of this blog (you must be out there somewhere) will recall that I ranted against a company called Equinity back in August. You can read about it here, but the gist of it is that I wrote them a letter asking them to repay unpaid dividends. They replied with 31 letters on the same day, each enclosing a cheque and each charging £11.75 as an administration fee. They billed me £364.25 to answer my one letter. You get the gist. They omitted the last phrase, surprisingly. This was a boilerplate dismissal. Nothing they mentioned applied to my situation. It involved one company, one bank — and Equinity, or Iniquity as I prefer to call them. This is the printed equivalent of ringing a help line and receiving a recorded message saying “Due to an exceptionally high volume of calls we are unable to answer yourself at this moment in time.” We’ve all experienced that, I expect. I woke at 04:44 this morning as usual, biting my pillow and my stomach in knots over those bastards at Iniquity. Suddenly it all became clear. Sod the Financial Services Ombudsman, I’d simply take Iniquity to the Small Claims Court. That might settle their hash. Then I remembered my previous efforts to wring money out of reluctant payers; all have ended in failure, including one who avoided paying me (well, my company) £12,000 despite him turning up at court with a barrister. He lost the case and I lost the money. I even sent in the bailiffs to no avail. And there was a cheque for £364.25. Of course it was made out to the wrong bank account, so I have to pay it into one and then pay it out into another. But at least I’ve got it. A good will gesture indeed. Why did we have to go though this palaver in the first place? We arrived in Harlech to find our view (see the photo behind this blog) hadn’t changed, but our viewing had. Someone had eaten, stolen or thrown away the blipper (remote control, thingummy, whatyoucall) that operates the television. It was nowhere to be found. Being a brand, spanking new machine (I bought it as recently as 2004) there are no controls on the set itself and is entirely dependent on its remote control. We had to get an All In One remote which managed to turn the TV on and adjust the volume, but that was about it. This morning I went to the tip, as is my wont, and as I was loading the kitchen floor into the skip I spotted my Philips television — well, exactly the same model as mine — looking rather derelict and sad for itself. Somebody had dumped my TV, which I always thought was cutting edge. So I asked the men if the remote had been dumped as well. One of them went over to the office and returned with — my identical remote! I brought it home, washed it (people are SO yucky) and it works perfectly. It set me to thinking, as well. All these blippers perform a number of functions, but they’re all basically the same. Yet some are far easier to use than others. This is down to one simple factor — design. So I have a great idea for a fascinating book: Remote Control Design. We could illustrate remotes from the earliest times to the present day, and provide inspiration and incentives to tomorrow’s designers. It’s an unstudied field. Everyone has one, nobody thinks about them. So, fotoLibra members, please start photographing all the remote controls you can find. Cutout, face on, against a white background for cutout, please. Please remember the 18% Grey Rule to ensure your whites are actually white. Please add to your metadata the make, model and type of device the remote operates — I have a remote control for my MacBook Pro, and it’s really useful, so Apple tells me. It’s still wrapped in its protective sheath. Publishers, please line up right here. This has nothing to do with photography or fotoLibra, but apparently there’s another Dear Leader lurking around as well as me. For those of you not in on the joke ho ho Jacqui Norman in her Newsletters and Picture Calls routinely refers to me as the Dear Leader. I refuse to speculate as to why. Anyway, it looks like the other Dear Leader might be handing over his crown shortly. Maybe this was where the winner of the Best Joke at the Edinburgh Fringe was referring to: “I’ve just come back from the holiday of a lifetime. 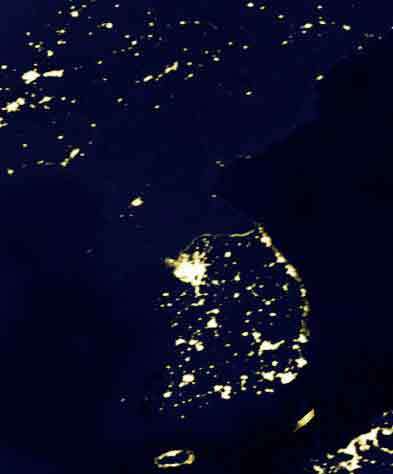 Never again.” Still, as this NASA photograph of the Korean peninsula at night shows, North Korea is a great place for star gazing. The lights go out on the 38th parallel. No light pollution here. In fact, nothing at all. Poor dabs.